Although Germany is known for its green technology and Energiewende (or energy transformation), it may surprise some people to know that it will not reach its 2020 carbon reduction goal of 40 percent. This is due largely to diesel emissions. On May 17, the EU Commission officially put Germany on notice for not reducing carbon emissions. In order for Germany to meet its future emissions reduction goals, the country will have to make drastic changes to its transportation systems at the national, regional, and local levels. With more than 15 million diesel cars on the road in Germany, the government and the automobile industry are pushing for new technologies to help reduce carbon emissions while still giving access to mobility. Car companies like Volkswagen have embraced this idea and started producing electric vehicles in places like Dresden and Wolfsburg. Roughly 165 electric Golfs are produced by Volkswagen per day. Although most of these cars are bound for the Chinese and Dutch markets, the company is confident that Germany, too, will embrace electric vehicles. The technology necessary for electric vehicles makes them more expensive than traditional vehicles. However, local governments in the metropolitan region of Hannover have begun using electric vehicles. Regine Kramarek, Deputy Mayor of Hannover, expressed enthusiasm for the city’s use of e-vehicles, noting that the police department now uses electric vehicles. In the coming years, the fire department will also transition from diesel to electric. 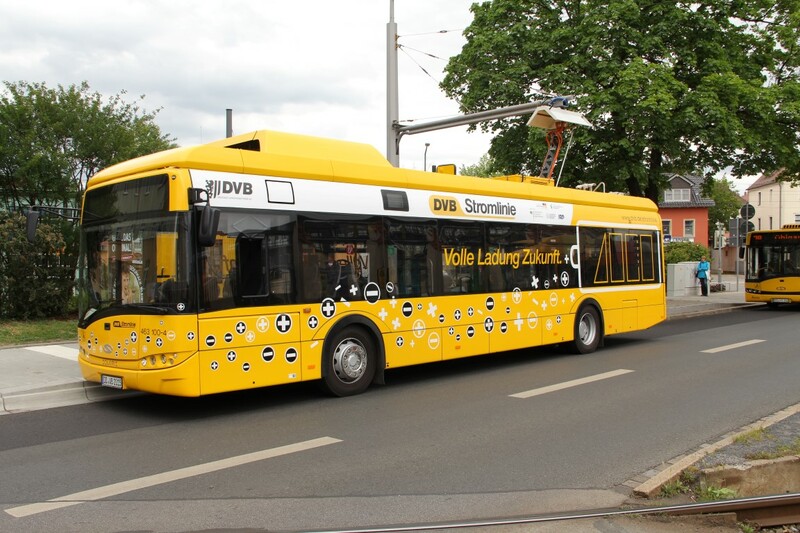 In Germany, large-scale production of electric buses has not begun. Though some cities have purchased buses, the average cost is nearly half a million euros, making it difficult for many municipalities to fully transition their fleet from diesel to electric. Additionally, bus charging stations would have to be installed throughout the city to make it a viable option for transportation. Dresden has purchased one electric bus and installed a charging station on the bus route. Until more charging stations are installed, Dresden, and other cities, will have to rely on other forms of electric mobility, such as light rail, or the Straßenbahn. For the average car owner, the problem with electric vehicles is the lack of infrastructure to support their use. Installing charging stations is expensive and not a priority. Companies like ubitricity, a startup in Berlin, have attempted to address this concern by retrofitting lampposts to include charging ports. However, it would be the responsibility of consumers to carry their own cable to connect to the station. German transportation experts are concerned that although the introduction of more electric vehicles would reduce carbon emissions, it would not reduce traffic. The goal is not simply a one-to-one exchange of diesel for electric but rather the reduction of the number of cars on the road. Therefore, municipalities are working to increase accessibility by improving public transportation and bike lanes. In Dresden, the departments of transportation and urban planning have developed plans to add more bike lanes. Like many cities that were leveled during World War II, Dresden was rebuilt as a car-friendly community with a limited bicycling infrastructure. Cyclists often have to compete with cars, as bike lanes are not extensive enough. Bike accidents occur on a regular basis in cities without strong infrastructure, and some are fatal. Formed in 1979, the Allgemeiner Deutscher Fahrrad-Club (ADFC), or the Association of German Bicycle Riders, provides a voice for cyclists across Germany. The organization lobbies for biker rights, including the improvement of bike lanes. Some advocates believe that the ADFC has just as much influence at the federal level as the ADAC, the German equivalent of AAA. This will be increasingly important as Germany tries to reduce the number of cars on the road. In addition to improving cycling infrastructure, city governments are working to improve the availability of public transportation. With buses, trains, and light-rail systems, German urban areas provide many opportunities for their residents to travel without ever needing a car. By constantly analyzing traffic flows, local governments introduce new routes on a yearly basis. Providing the opportunity for multimodality – meaning the ability to switch between car, public transportation, bicycle, and foot – has become a clear goal for many German cities. If multimodality is to become the standard, riders must be able to switch seamlessly from one form of transportation to the next. Through the development of cell-phone apps, local governments hope to allow riders to reserve shared cars or bicycles, get information on charging stations for electric vehicles, and have public transportation schedules. Riders have access to all forms of mobility right at their fingertips. While cities are working to provide accessibility to their residents, car manufacturers are trying to stay one step of ahead of technological trends. The German car industry remains the most important industry for the country. There is an overall sense that unless the car industry evolves with current automotive trends (such as electric cars and autonomous driving), Germany will be left behind. In Berlin, on the campus of EUREF, an incubator for urban development funded by the European Union and the German government, experts and policymakers strive to anticipate future transportation needs. Engineers work on new technology to make transportation more digital, including the development of autonomous vehicles. Autonomous vehicles have the potential to offer accessibility in areas with little public transportation. Not everyone agrees that autonomous vehicles are the best option – and it remains illegal to test them on public streets. In mid-May, the Federal Ministry of Transportation and Digital Infrastructure released a report outlining new mobility and fuel strategies for the country, with the aim of becoming less dependent on fossil fuels. Although the federal government is trying to set standards, the role of cities is becoming increasingly important. It is at the local level that the true challenge of reducing greenhouse gases and improving public transportation is being addressed. Germany may have a long way to go to meet its carbon reduction goals, but cities across the country will be important catalysts behind the movement. This information was gathered during a weeklong Study Tour on Urban Mobility hosted by Post-Carbon Cities of Tomorrow (POCACITO), an initiative of Ecologic Institute. Funded through the European Recovery Program of the Federal Ministry for Economics and Energy, the tour brought together 15 young American professionals working in the fields of transportation and urban sustainability. Through meetings and site visits in Berlin, Dresden, Einbeck, and Hannover, the group received an in-depth look at how Germany is rethinking its approach to urban transportation in the digital age.